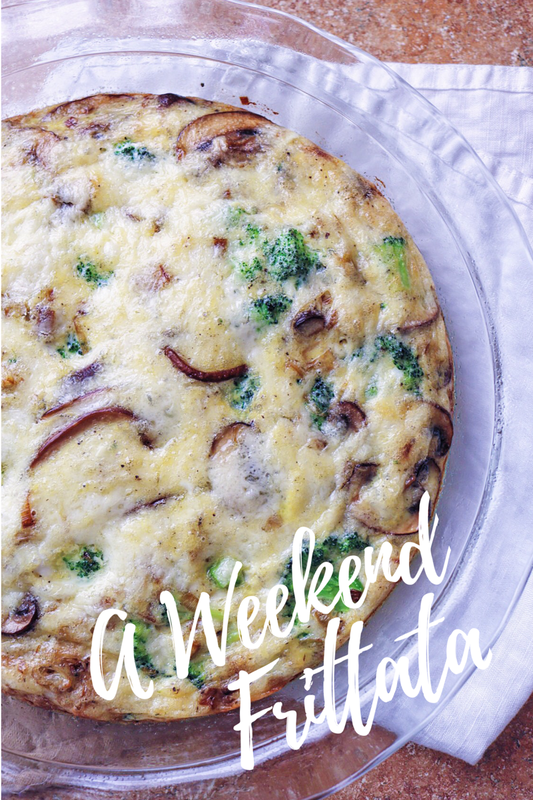 This Weekend Frittata is a dish you can spend a relaxing morning prepping and cooking up that is a savory and earthy blend of flavors for breakfast. 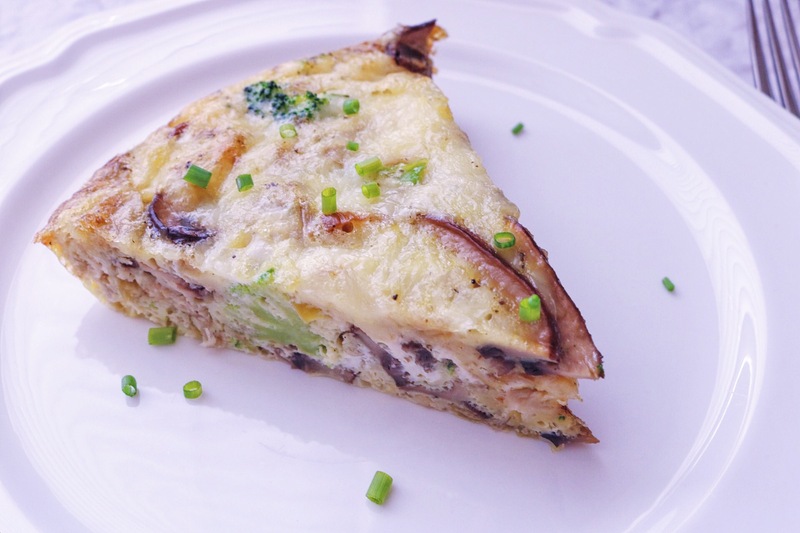 This frittata is packed with Cremini mushrooms, leeks, broccoli florets that are browned and cooked down until tender and then mixed in the egg mixture with a good helping of shredded Havarti cheese. I love a frittata because you can prep it, bake it up, enjoy some and then store it in the refrigerator and reheat servings when you want. This way you’ve got a fresh, healthy breakfast that you can reheat during the week when you’re in a hurry to get out the door. Another great thing is that the filling for the frittata can be prepped in advance, so you can cook up the vegetables, and shred the cheese ahead of time and then when you’re ready stir them into the beaten eggs and bake. I love this because if you’re hosting a breakfast it’s great to get some of the work out of the way before the morning of. The morning I made this frittata I was invited last minute to go on a hike with some girlfriends. Thankfully the baking time was almost up, I had just enough time to eat a slice before I was out the door. I had plenty of energy for the 7 mile hike thanks to this protein and vegetable packed breakfast. The hike was a beautiful path through pines and up and down mountainsides with perfectly warm fall weather. My legs were so so sore after, it was a perfect day. In a medium bowl add ice and water, set aside. In a sauce pan add water and bring to a boil. Add broccoli florets and let cook for 3 minutes. Strain broccoli and immediately add to the ice bath to stop the cooking. Strain and remove as much excess water as possible. Set aside. Heat a medium size skillet over medium heat, add 1 tablespoon of the butter butter and olive oil. When the butter has melted add the leeks and a sprinkle of salt, let cook about 5 minutes until they soften and start to brown, stirring often. Add remaining 1 tablespoon of butter to the pan, and add in the mushrooms and an additional sprinkle of salt, turn the heat to medium-low. Let the mushrooms cook down and brown for 12-15 minutes, stirring occasionally, making sure to scrape all the brown bits from the bottom of the pan as they cook. Once the mushrooms and leeks are tender and browned remove from heat and let cool. Coat a deep glass pie dish with nonstick spray and set aside. In a large bowl whisk the eggs, season with salt and pepper. Stir in the leeks, mushrooms, broccoli and half of the shredded cheese. Pour the egg mixture into the pie dish, and sprinkle the remaining cheese on top. Place uncooked frittata in the oven and bake for 38-42 minutes, or until it puffs up and the edges are golden brown. Remove from oven and serve warm. Another way to test if the frittata is finished cooking is to stick a knife into the middle and if it comes out clean it’s ready. The frittata can be served warm or cold. It will stay fresh for up to 5 days in an airtight container in the refrigerator making it great to make ahead of busy mornings. To reheat, place a serving in the microwave for 30-45 seconds. We love the frittata. I’m making two versions tomorrow morning before baseball. One kid friendly with sharp cheddar cheese and ham. And the other packed with bell peppers, onions, havarti cheese, tomatoes and broccoli. Yummy! Thanks for reminding me of this easy dish. Love you.